Asus ZenWatch 3 In-Depth Thoughts: Specs, Price, and Availability. Circular Smartwatches are the next big thing; A thought processed first by Motorola later carried by everyone else. It was their way of simplifying things back to its original form, rather than just a marketing gimmick. Later on, the idea of bringing a circular Smartwatch was picked up by Huawei, LG, Samsung. Etc. Just because of the fact that the design looks much more natural & traditional. 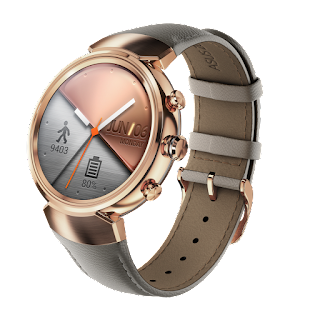 So carrying that same old classy fashion forward, Asus has launched the all new Asus ZenWatch 3, A Watch with round diamond cut bezels and 3 Navigational buttons. Not only does it come equipped with different ways to input, but the processor inside is much better and energy efficient. Whereas there's also a boost in charging with the implementation of fast charging that we usually see on most smartphones these days. So today let's find out more about the new Asus ZenWatch 3 in detail. It comes with Qualcomm's Snapdragon Wear 2100 (APQ 8009w) Quadcore Processor equipped with 512 MB RAM & 4GB eMMC of onboard storage. It has a 1.39 inch(400x400) AMOLED display giving it a pixel density of 287ppi. Whereas here it has 2-Finger gesture operations available. It has inbuilt 6-Axis(Gravitational + Accelerometer) sensor to take care of your fitness tracking activities & it also has an Ambient light sensor, which works in incumbency with AMOLED panel to provide prolonged battery life. It supports Bluetooth v4.1 & Wi-Fi. It has a 340 mAh battery which for the first time supports Quick-charge technology due to upgraded processor. It runs on the latest version of Android Wear OS. It is available in Silver, Rose Gold, and Gunmetal colors. Asus ZenWatch 3 - In-Depth Look at Subtle Differences. So the Snapdragon 2100 processor gravitated towards Smartwatches was launched earlier this year, To ensure Maximum battery life and performance. The newest processor helps in a prolonged battery usage, whereas it supports hypercharge technology & it's the first Smartwatch in the world doing that. The Hypercharge Technology charges your smartwatch to approx 60% in just 15mins, which is capable of providing a single day of juice & Overall the battery can last up to two days long When fully charged. Considering the Design, It's almost strikingly similar to the current Huawei Watch if we knock off the three buttons placement. The 2 & 3 button perform the same job as they do on conventional Smartwatches & Those have been tightly integrated into the system. Whereas the top or the 1st button can be customized, You can set any App or trigger any particular function by just tapping it. Tapping that button for a quick hike to measure fitness activities might serve as a good thought. The three button placement is what, which is again new and let's see how the world adapts it. Then the circular watch Design has materials made out of Design Jewelry Grade 316L Stainless Steel making it look both extra sharp and feel sturdy. The Asus ZenWatch 3 also has a Diamond Cut Bezel surrounding the dial, Everything lying under a body which is just 9.95 mm thick. Then moving forward to Bands, we've rubber, and Genuine stitched leather straps available right out of the box. Asus promises that the ZenWatch 3 will receive the future software updates, and it already runs the latest version of Android Wear OS which is currently out. Although a newer version of the Android Wear OS might soon hit the market, in my opinion. The newer OS has Six different pre-installed themes, and Up to 50+ watch faces with an exciting addition of Watch Face Designer App. Application's wise Asus has bundled a suite & host of new things on board. First, It's the Asus ZenWatch Manager - Your one stop destination for making OS level changes to your watch from your Smartphone. 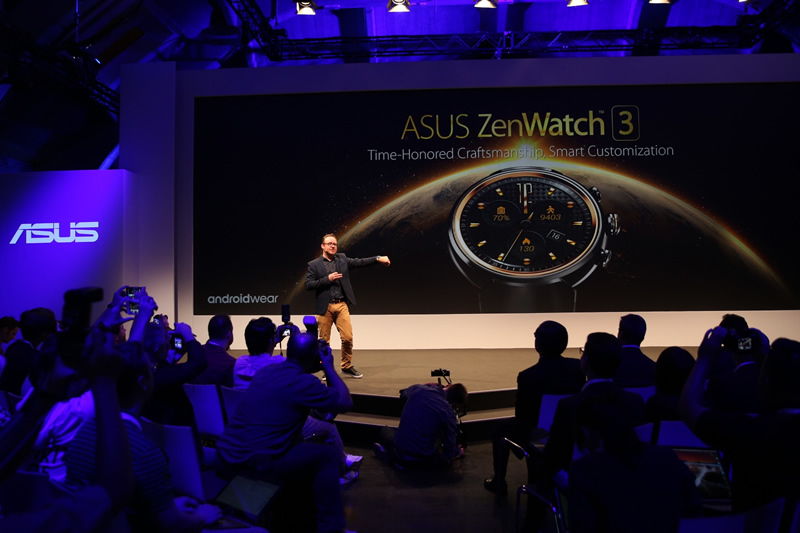 Then we have Zenfit App, and Asus again has a separate dedicated app for both Smartphones and ZenWatch 3. Asus claims that the Zenfit app can provide up to 95% accuracy concerning fitness count, which according to them is said to be industry leading. So far the Best Fitness Tracker regarding accuracy, I've seen yet is the Mi Band(1st Gen), So let's see how it performs when if it launches here in India, anytime soon. So the Asus ZenWatch 3 will come with a box accompanying a Magnetic Charger, a separate Watch Stand & an external Battery Pack. Yes, you heard it right an external battery pack. It is a similar concept of let's say an iPhone Official Battery Case. The magnetic points will align correctly with the Battery Pack inputs & that's how your watch would get charged on the go. But beware that's going to add some unnecessary bulk to your wrist. Though Additionally, the external Battery pack would be a great travel companion. So with all that, Asus has done a great job regarding bringing value to the table and much more importantly focusing on the current need of Smartwatches, which is Battery life. The Asus ZenWatch 3 has been priced at €229(Euros)/Rs.17,599 & Rs.18,999 depending upon bands, Cases and it's available in the US and Germany since October. However starting today which is 23rd Dec, 2016 it's available to pre-order exclusively via flipkart. So if you ask me, Am I excited for this? The answer would probably be, Yes I'm. Everything just got updated in the circular smartwatch segment rather than the boring same old chin thing, Don't you agree? Let me know in the comments below what do you think about the new Zenwatch 3, will you buy it? Now Available for pre-order on flipkart: Flipkart. Also See: Upgraded Asus Zenfone Max 2016 Review : 7 Things You Need To Know.